In order to maximize your health and reduce your chances of developing autoimmune diseases such as Hashimoto's, Celiac disease, rheumatoid arthritis, diabetes and other illnesses, it pays to know your blood type. Let's explore this concept in more detail. Most people pay little attention to their blood type as it seems it is only important when you are going to have an operation or other procedure when you might need blood products given to you...or when you are having a baby. However, science has shown that blood type is indeed important for reducing disease and illness and living a more energetic, healthy life. A life that allows you more time to focus on your dreams, desires, family and friends...instead of visits to the doctor or hospital. I earned certification in blood type science (under the tutelage of Dr. Peter J. D'Adamo) from the Institute for Human Individuality and currently hold a fellow from that organization. As a result of this training I have learned about the direct and indirect relationships between what we choose to eat and various disease processes that plague humanity and have seen first hand the benefits of using blood type in dietary recommendations. Most people are familiar with ABO blood typing. 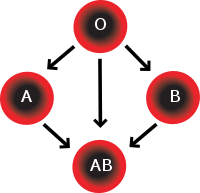 There are 4 of these blood types: O, which makes up 45% of the worlds population, A, which comprises 40% of world population, B, which is 11% of global population and lastly AB, which only makes up 4% of the world's population. Genetic control is what determines your specific blood type. Just a small piece of sugar thatʼs stuck on the outside of your red blood cell creates your blood type. Each one of your cells contains millions of different sugars, including the blood type sugars. These sugars are manufactured by the cell, controlled by your DNA. Just like eye or hair color is a genetic quality, your blood type is a very unique part of who you are. Your blood type doesnʼt change either- if youʼre AB, you will always be AB. The sugar for type O is fucose. The sugar for type A is a combination of fucose and N-Acetyl galactosamine (or GalNac for short). The type B sugar is fucose with D-Galactose. Type AB is a combination of A and B, with all three blood type sugars. This is why AB is the universal receiver of blood. The immune system works by identifying what is “you” and what is “not you”. Since AB has all three sugars on its blood cells, it recognizes each one and wonʼt cause a rejection. Type O is the opposite, known as the universal donor. Since O blood doesnʼt have GalNac or D-Galactose, it sees the other blood types as “not me” and will try to destroy them. The same is true for B and A. They can receive blood from O, but not from each other. People arenʼt the only ones with blood types. The sugars (antigens) that make our blood type are actually all around us in the environment. They can be found in a variety of animals, microbes, dirt and even food. One example is the virus. Many types of viruses have antigens, like our own antigens, that are made of D-galactose. D-galactose is what makes blood type B, so when somebody who is type B contracts a virus, their chance of infection is greater. Just like a transfusion works on “self” vs. “non-self”, if a virus looks like you (type B), your body is going to be less likely to destroy it than if it looked like type A. The most important point is that some foods have blood type antigens too. The best example of this is milk, which contains large amounts of D-galactose, the type B sugar. Pork is another example, as a source of GalNac, the Type A sugar. Seaweed is a significant source of fucose, the sugar for all the blood types. Due to the many health damaging effects various lectins can have on the health of people with different blood types, I utilize blood type in my individualized dietary recommendations...with great success. I invite you to learn more so you can be healthier. Call me at 586-731-8840 and click on the link below for this awesome guide!